This month, AIP Foundation implemented its largest school-based program to date. Thanks to Johnson & Johnson, 11,000 helmets were donated to twenty different schools and we were able to bring helmet education to children in a region often overlooked: central Vietnam. It is truly inspiring to see how many children can be reached when the right players are brought together. World Bank and UN Partners Boost Action on Road Safety - The World Bank hosted the 15th UN Collaboration on Road Safety meeting in Washington, DC on April 16-17, aimed at strengthening efforts to support road safety action in the developing world ahead of a UN General Assembly debate on road safety on April 19. Work starts on ten fly-over bridges - Japan has decided to grant $6.4 million to help develop a traffic control system for Ha Noi's expressways. Johnson & Johnson committed 140,000 USD to running Helmets for Kids programs in Vietnam's Ha Tinh, Quang Binh, and Dong Nai Provinces. 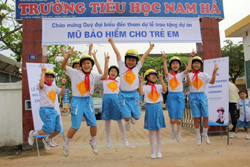 The helmet handover ceremonies took place in Quang Binh and Ha Tinh on April 9th and 12th and in Dong Nai on the 16th. In total, 11,000 helmets are being donated to primary school students and teachers in 17 schools in central Vietnam and 3 schools in Dong Nai. 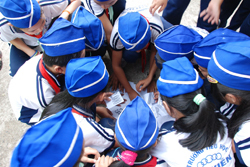 Combined, this makes up the largest school-based program ever implemented in Vietnam by the non-profit Asia Injury Prevention (AIP) Foundation. Some of the country's major highways run through these three provinces, creating a very dangerous environment for the students of the schools located along them. In addition, Ha Tinh and Quang Binh do not receive much financial aid to supplement their limited road safety funds. In Dong Nai, one of the project schools recently lost a student in a road accident. The sponsor, Johnson & Johnson, is committed to improving road safety around the world, particularly in the context of the UN Decade of Action for Road Safety, and donated these funds through the Road Safety Fund run by the WHO and the FIA Foundation. Johnson & Johnson is also an active member of the United Nations Road Safety Collaboration. On April 21, 2012, 500 primary students from 32 primary schools in Trang Bom District in Dong Nai Province joined a major Safe Kids road safety event sponsored by FedEx. The children had a chance to enjoy outdoor activities while making a habit of complying with traffic laws. The event, which is part of Vietnam's Safe Kids Walk This Way program, included two sessions: outdoor recreational games in the morning and group discussions in the afternoon. Children painted pictures, made crafts, worked together in a "game show", and more. In the afternoon, they participated in discussions about road traffic law compliance, working in groups and role playing. This full day of activities got 500 children excited about road and pedestrian safety, and ensured among them a better understanding of road traffic laws. Equipped with this knowledge and enthusiasm, they are sure to be safer when they use the road every day. In honor of Vietnam's Year of Traffic Safety, District 9's Department of Education and Training collaborated with AIP Foundation to run a Traffic Safety Camp for four of the district's primary schools: Phuoc Long, Phuoc Thanh, Nguyen Minh Quang, and Truong Van Thanh. 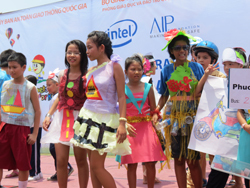 The camp was sponsored by Intel Products Vietnam. Throughout the activities, pedestrian, road, and helmet safety lessons were repeated and encouraged with the aim of making this knowledge second nature to this generation. This was also an opportunity for students from AIP Foundation's school-based programs to meet each other as well as 300 Intel volunteers, and talk about traffic safety. The Intel volunteers played with the children, starting with decorating tents and making signs bearing road safety messages. Another activity involved shaping sand into various road related scenes or objects. The children were especially enthusiastic about the Green Bamboo game show, as well as the songs, fashion shows and dances featuring their fellow students. 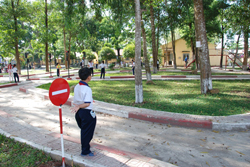 After working with the Trang Bom Department of Education and Training, the Traffic Safety Park is ready to welcome children practicing their road safety skills. 1,600 students from 32 primary schools (50 students per school) have been using the park every Saturday from March 10 to May 4, 2012. Before they begin, students are taught games which enable them to use the park effectively. The purpose of this practice course is to encourage and equip children to practice good road safety behaviors. Crash with bus kills 5, but accidents down for new year - A bus collided with three motorcycles in Battambang on April 15th, killing five people. However, the number of people killed on Cambodia's roads during this year's Songkran Festival was 48, which is 10 fewer than the number who died in the same period of time last year. Cambodia's National Road Safety Week was April 7th to 14th, and Cambodian road safety stakeholders including AIP Foundation took the opportunity to partner with the government to give their helmet promotion strategies an extra push. 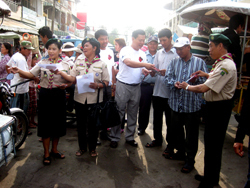 A roadside awareness campaign was run in Kampong Speu and Kampong Chhnang from April 2nd to April 6th. Hundreds of riders without helmets were stopped along the road, and children were given free helmets if they were not wearing one. In addition, they were informed about the upcoming legislation amendment which will require motorcycle passengers to wear helmets. In Kampong Chhnang's town center, a booth was set up to advertize helmet safety and conduct question & answer games with visitors. On April 7th, AIP Foundation's Cambodia Country Director delivered a speech at the Cambodian government's National Road Safety Week event. He took the opportunity to lead a discussion about the National Road Safety Policy, the 10 Year Action Plan, and the draft amendment of the motorcycle helmet law. Organized by the Kandal Provincial Department of Public Works and the Boy Scout Unit from the Department of Education, Youth and Sports, AIP Foundation's program team conducted public awareness outreach in Kandal Province. AIP Foundation supplied 10 t-shirts, 20 helmets, and 5,000 leaflets and distributed them alongside the organizers. The United States Embassy in Cambodia organized their Annual Health Fair this April. The Centers for Disease Control and Prevention's Cambodian branch nominated AIP Foundation to be involved in the fair to promote helmet use. The booth displayed promotional materials about helmet use, the inclusion of passengers in the law amendment, and road safety on a general level. 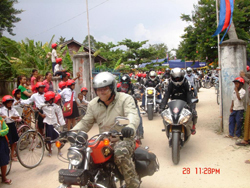 475 primary school students received free helmets donated by the Go4 Charity Ride motorcyclists who rode from Bangkok to Phnom Penh in February 2012. The donation of funds to run a Helmets for Kids at Prey Sandek Primary School was officially launched this week, providing helmets and helmet use education to all students and school teachers. In addition, outdoor activities will be organized and the school fences will be painted with road safety messages to remind parents to protect their children. The Go4 Charity Ride was sponsored by the Danish Embassy as well as DAMCO, MAERSK, CBRE-Cambodia, and PTT. The Royal Thai Police blocked traffic in the center of Bangkok to record commercials urging people to be safe on the road during Songkran Water Festival. AIP Foundation attended the Safe Behavior sub-committee's first meeting, under the National Road Safety Directing Center. 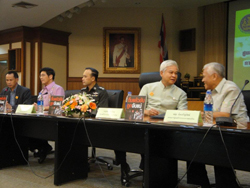 The meeting was chaired by the Royal Thai Police and there were around 30 participants attending from various organizations. The meeting outlined the roles and duties of this sub-committee and discussed 8 implementation plan alternatives in an effort to foster safe road user behaviors. One of the issues in focus was the enhancement of helmet wearing in academic settings. A representative from the Bureau of Special Affairs in the Office of the Permanent Secretary, Ministry of Interior, was assigned to draft a plan for schools to set up rules mandating student and teacher helmet use. Another major point of discussion was the development of a public awareness campaign around drink-driving during festivals. A press conference was held to launch the Accident News Center through the Road Safety Directing Center (Department of Disaster Prevention and Mitigation, Ministry of Interior). The Accident News Center will gather all local news relating to road crashes or incidents reported which would be of concern to the press during Songkran Festival. The event Deputy Prime Minister, Mr. Yongyuth Wichaidit, presided over the event. AIP Foundation attended this event along with Thai celebrity and road safety ambassador, Mr. Dom Hetrakul. AIP Foundation co-hosted a campaign for road safety with the Imperial Queens Park Hotel. The Ambassador of Denmark led a convoy of 50 motorcycles down Sukhumvit Road to urge people to drive safely during Songkran Holidays. Public shuns A4C rally at Kololo grounds - Activists for Change (A4C) planned a rally at Kololo airstrip to protest the alleged continued brutality against Ugandans by police officers. However, the government outlawed A4C the day before the protest, boda boda drivers were not allowed on site, and those who came found only a meager crowd of people. 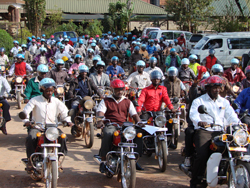 A sixth workshop was held to sensitize and educate boda boda operators from Kampala's Rubaga Division about helmet use. The workshop program took a full day and the 100 operators who attended came from Kategula and Marvin boda boda stages. Prior to the workshop, these stages were observed to estimate current helmet use rates. They were then observed post-workshop to capture new rates of helmet use. A test is carried out to assess participants' knowledge before and after every workshop. All participants received a free helmet.